I had read all the articles and I was ready. 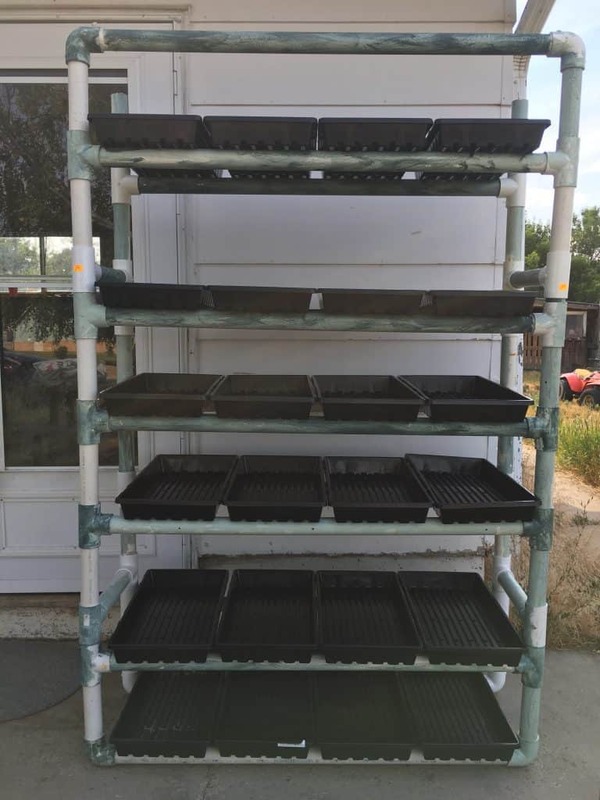 I had even made my fodder shelving and bought these awesome durable, heavy seedling trays. I was ready. And then I decided to do a bit more research. I’m really good at jumping in and just doing something and then later wondering what in the world I was thinking. Are you like me in that regard? I hope not! If you prefer to watch a video about this information instead of reading, click the video below! In other words? It had to be worth it. Worth the time investment and not be a detriment to our pocketbook. 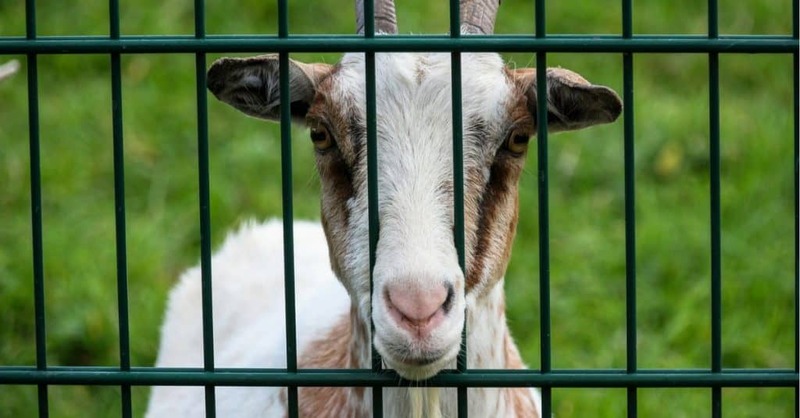 If you are already raising livestock, you already know this: animals are not cheap. And at every turn, we are looking for ways to raise healthy animals and save some money. Who did I turn to for my information? I knew that I had to go deeper than the average blog post. I wanted to know really what was going on with feeding fodder and one of my first goals was to be able to create a calculator for myself (and you) to be able to use to calculate how much grain in pounds it would take to grow enough fodder in weight for the specific amount of animals that were owned. So I reached out to the Montana State University and found a very helpful and informative professor under the title: Extension Forage Specialist, Department of Animal and Range Sciences. And I asked a lot of questions. But first, let’s begin with what these words even mean. Very specifically speaking, “fodder” is the food that is fed to an animal by its owner, as opposed to “forage”. Forage is the food that an animal will find for itself in a designated pasture or area of grazing. More recently there has been a resurgence of interest in sprouted grains, also now known as fodder. Usually, the grains are sprouted to about 6 inches tall, which will take approximately 6-10 days. The week-old sprouts are fed to the animal in its entirety. Meaning, the leaves (grass), roots and any remaining seeds that didn’t sprout are all fed to the animal and eaten. No dirt is involved. In this quick turnover of seed to grass, there is no need for dirt and the roots become a heavy mass that is rolled up and toted out to the animals. Generally speaking, it is fairly easy to grow fodder. 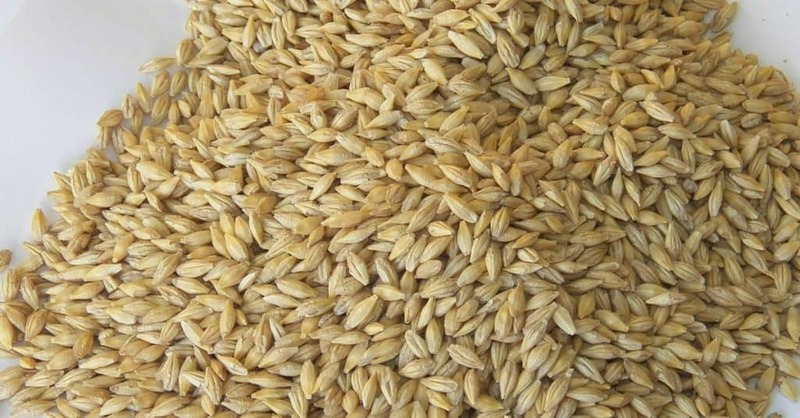 One article says that it is “practically effortless” to grow sprouted grains. The seeds should be wet down with water 2-3 times a day and drained well each time. No standing water should be left in the trays. Do step number 4 until the growth has reached 6 inches. This will usually take between 6-10 days depending on the heat in the room and the amounts of water used each watering. Harvest! Dump out the fodder (it’s heavy!) and either roll up or cut it up into manageable pieces. Clean and disinfect trays immediately and very, very well after each use. Repeat each day. Every day a tray is taken out, one replaces it making this a continual cycle of growing and harvesting. Fodder systems can be as easy as setting a small container on the windowsill and they can also be set up to be completely automated after the seeds are in the trays. Some systems can be connected to a water source where the water is reused and pumped to rinse the seeds throughout the day automatically, which helps lessen the time spent manually rinsing several times a day. Any article about sprouted fodder will give a very impressive list of benefits. And who wouldn’t want these benefits for their animals? Reduction in overall daily feed costs. On-demand availability of fresh green feed 365 days a year – all season access. But this impressive list isn’t the beginning or end of this discussion. There’s more. A lot more. In my research, I found that when talking to people who know what they are talking about in regards to animal nutrition, a lot of the wording and technical aspects of the conversation can quickly go over my head. This subject about nutrition and the bioavailability of starches, sugars, and the makeup of grains, and hay can get deep and complicated very quickly. Not only can grains and grasses grown in different pastures and parts of the country have a completely different nutritional content, but when, where and how they were harvested also affects the outcome of the feed as well. And all grains are not equal either. Depending on dirt health, harvesting, age and how long they were sprouted all change the outcome of what ends up being fed to an animal. So in short, to say that my hay quality and nutritional makeup is exactly equal to your hay, is impossible. Which would also mean that my barley grain and the sprouts I produce, could not be said to be equal (or better or worse) without testing the specific grains used and the final fodder product. Is this getting heavy? I hope not! Because this is where the whole fodder conversation gets blown out of the water. Well known or not, animals rations must be calculated and fed on a DRY MATTER basis only. This is so important, I must say it again: Animals MUST BE fed on a DRY MATTER basis only. But it’s a very deceiving claim. Why? Because of the dry matter. If you have lugged around a mat of fodder, you know how heavy it is! Incredibly heavy! And all that weight is moisture. In fact, fodder is made up of about 80%+ moisture content compared to the 15% moisture found in hay. 2 pounds of grain (1.9 lbs dry matter), which has approximately 95% dry matter (DM), grows into “grass” in 6-10 days, which weighs at this point 12 pounds and has 10% dry matter (DM). So what has the dry weight of the fodder become at this point? Wait, what?? The fodder has actually LOST dry matter. For every 2 pounds of starting seed, it will, in fact, have lost almost a pound of dry matter! And why does this matter again? Because animals are fed on a dry weight basis. And when you are crunching numbers like I do continually, losing feed is not an option and if it happens, it is very costly and can be detrimental to the bottom line. But how does this happen? What is going on inside the seed to lose dry matter? When a seed is growing into a plant, it uses up its stored carbohydrates. This stored starch is used up during the first week of life. Usually, at this point photosynthesis takes over, roots develop and the plant can begin to uptake minerals. But in the case of hydroponic systems, dry matter and carbon are being used up during the 10-14 days of growth, which leads to the loss of dry matter. So, the longer the sprouts are growing to reach the desired “6 inches of growth”, the more dry matter they are losing. What About the Previously Mentioned Nutritional Quality Improvements? Sadly (because I really like the idea of growing fodder) there isn’t any valid research backing up the nutritional quality improvements. Now do animals usually love the fodder? Oh yes, they do! Chickens might knock you down to get to their fodder treats! The fresh, moisture filled product is very palatable and pleasing to most animals. What does this mean for the fodder product? It has lost energy and has actually lost feed value when it is compared to the original seeds themselves. Those barley seeds? Their feed value is at least as good, if not superior, to the fodder. When Does It Make Sense to Sprout Grains? Does this mean that it never makes sense to grow fodder? No, not necessarily. Small animal treats. Chickens and rabbits will love the treat! If you fall into one of those categories, great! But don’t forget to count the cost first. This will not be something that will save time, money or feed. What Are Some Cons and Challenges of Growing Fodder? This was another important factor that I had to consider, despite my adamant desire to grow fodder for my animals. I wasn’t going to just grow a batch here and there of fodder. My original plan was to use fodder to supplement much of the hay we had to harvest and stack each year for my animals. But I had to ask the hard questions. How much time would I have to devote a day to growing fodder? What are some of the challenges that come up and cause problems? I am looking for ways to simplify and improve. So what challenges come up for those growing fodder? The nutrient quality is solely and only dependent on the quality of the seed bought because only water causes it to grow. Low nutrient grain? Low nutrient fodder. Mold. That rich, brown dirt out your window? It has wonderful microbes that keep pathogens at bay. In a hydroponic system, mold, mildew, and other pathogens can quickly spiral out of control if the proper temperatures and humidity levels get out of control. And a moldy batch of fodder cannot be fed to animals, which is another potential loss. A controlled climate is needed to keep temperatures and humidity at appropriate levels. Time spent cleaning the seed (if it wasn’t pre-cleaned), soaking the seed, laying out the seed, watering (if an automatic system isn’t set up), cleaning the trays (to prevent mold), and feeding the fodder, can add a significant amount of time to chores. It’s an every day, not miss a day type of system. No time off for you or the fodder. It is very wet and heavy and can become a challenge to transport. Bulk feed storage can sometimes be a limiting and challenging factor. Electricity and a water source are needed and depending on the setup location, that can cause challenges. But where there is a will, there is a way. Sometimes challenges can be mastered and if your heart won’t be content until fodder is made available for your animals, don’t let these reasons stop you! There is absolutely nothing wrong with growing fodder for your animals. Many people have jumped on the idea of growing sprouted grains. It feels like something you “should” do, right? But I gotta tell you, I want fodder to be all that and a slice of bread, I really do. But the facts cannot be overlooked just because the internet says so in a handful of places or because I want them to. Fodder has made a resurgence but it’s worth looking into the facts a little more deeply, isn’t it? The grass just may not be greener on the other side after all. This article was written in 2013 and talks about the experience of several people using fodder. It would be interesting to hear the update, the verdict was still out on their profitability and it’s effectiveness: A Revolution in Animal Feed? Read the comments. DM is not the only thing to consider. Digestibility and nutrients play a huge role. Thank you for your comment 🙂 I really set out to write about exactly what you said: digestability and nutrients and all the wonder of fodder. But when I reached out to the extension forage specialists I got such a different response. At this point, I haven’t read the research that shows the huge nutritional advantage apart from blog posts saying the same thing over and over. Or fodder systems proporting the advantages of fodder, but even then, there is no research to back their statements. Delci, Thank you SO much for researching and writing about this. 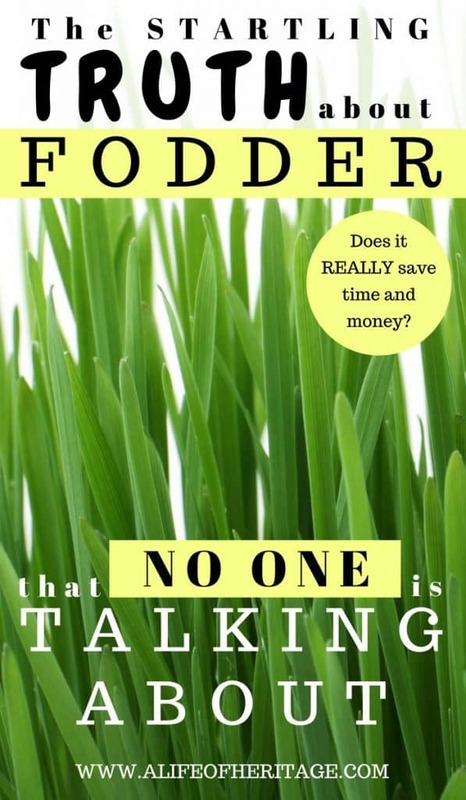 My husband and I have been discussing starting fodder systems after we get moved to ID, and your article is definitely useful in our decision-making. Who knew about the dry matter? SO interesting—-Anyway–awesome-sauce as usual! I always enjoy your interesting posts. I have been researching fodder for a while, and here’s something that I don’t see anyone talking about. I’ve seen a lot of discussion about dry matter when comparing fodder vs. hay, but what about horses that are on pasture? For example, I have some horses on land that is irrigated, and their only source of feed is the pasture they graze on, no hay, nothing but a mineral block. These horses are in good body weight, some have even nursed foals. How is fodder any different than irrigated pasture? I’m asking because I really want to know. And anyone who has gotten hay knows that sometimes the hay has a high moisture content, and other times it’s bone dry. The bale is the same size, so the hay volume is the same, but moisture content is clearly different. Hey Tracy! Thank you so much for your question! It’s a good one! The difference is that grass in a pasture has roots that begin to take up moisture and nutrients from the ground. As with fodder, it sprouts and uses up its stored carbohydrates, dry matter and carbon. But as the grass in the pasture grows it begins to take up moisture, minerals and photosynthesis takes over. But the fodder doesn’t have that chance. Fodder just spends all it has as it grows taller and taller. But also, as you know, even grass in a pasture can have a different nutritional makeup based on how old and healthy the ground is, how much water it gets, what type of grass, what time of the year it is etc. So even in one pasture, the quality of a field can go down as the summer progresses. And even when and how hay ground is cut and how it is stored also affects the final nutritional outcome. And as you pointed out, some bales are seemingly the same size but one will be very heavy because of moisture content. But when feeding, this moisture content must be taken into account to feed the proper amounts to each horse. 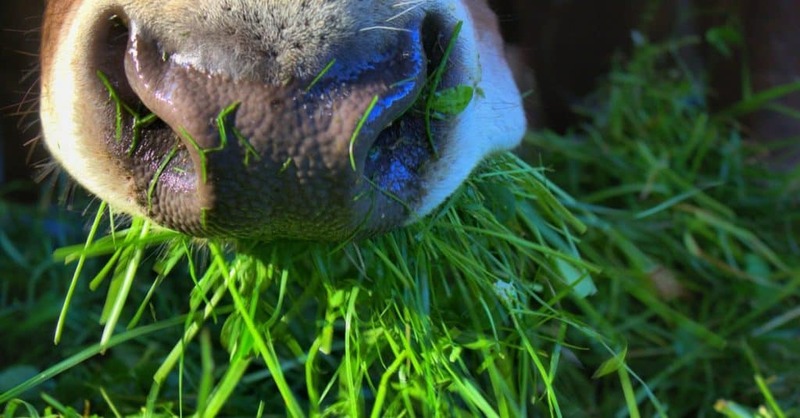 So, fodder can be an excellent supplement for animals, if all of these factors are considered and not only the “amazing height it can reach in 10 days” because really, that height only means it has lost a lot of valuable nutrients in the process. And for me, the time it would take to grow fodder for all of my animals and that it truly wouldn’t save me any money, told me that I just couldn’t take on this project right now. Great article on fodder. A method not for everyone. However, there are some other considerations that need to come into play. Please consider. : MSU oats vs sprouted oats: First of all, oats (any grains) are not an appropriate feed for cattle. Sprouts are an appropriate feed for cud chewers. So comparing the two is not sensible. The good people at MSU (my local ag university) know better, but their money does not come from supporting healthy animals and quality food. Grains cause an acidic condition in ruminants which causes health issues which keeps the vet happy. Grain fed milk and meat production causes a chemical change in the milk/animal fat produced. This changed fat is unhealthy, the negative human health results of which is why so many people are anti red meat and milk. Grass (fodder) fed makes great and healthy to eat milk and meat. : Nutrient dense does not mean calorie/protein dense. There are, in fact, endless studies on sprouts being far more nutrient dense than seeds. The seed is the base, undeveloped material. It has some basic nutrients (starch, protein), but it does not have the developed vitamins and other nutrients that cannot form until the seed germinates. A sprout is far more nutrient dense. The seed is not a compacted sprout. : Carbohydrates. Seeds have starch. Ruminates are not made to digest starches. Ruminants need sugar from plants. Sprouting changes the seed starch to sugar. It is a choice between feeding fewer pounds of appropriate food and feeding based on more pounds of inappropriate food. : Dry weight as the basis for feed calculation. Is the dry weight even assimilable? Is the dry weight actually an appropriate food? Is the dry weight a complete nutrition or does it cost more money in vet bills and supplements? Will the animal need to eat more dry weight because what is being fed is an inefficient or incomplete food? Dry weight is a very poor way to calculate feed for animals. That method assumes that anything which is dry weight calculated is a good feed. Gravel (dust) has way more mineral content than even grains. Fish meal has way more protein content than grains. Measured by dry weight, gravel and fish are hands down better than grain, fodder, or grass. And yes, they are used as foods. But is the animal’s body made for this type of diet? Ruminants need less dry weight intake when their nutritional needs are met, and it can be significantly less. When I let my cattle have free choice minerals, my hay usage drops by 20 percent. It is all about nutrition, not about dry weight. Fodder is not for everyone, probably not for most. But a chicken egg has far more omega 3 fats when fed green grass, fodder, or sprouts, than one fed on grains. I’m after that very healthy dark egg yolk for family health, even if the chicken does eat less dry weight when making a superior egg. I really appreciated your thoughtful reply! I’ve wondered if I could figure out a system to feed my animals a sprouted grain. So, for instance, barley. I could sprout it and then feed it on the second day, or something like that. My goal is to find the best way to feed my animals the best quality and high nutrition food possible, without breaking the bank or my back and time. I have been feeding my laying hens sprouted grains for about 4 years now. Not only has my feed expense gone down significantly, my hens lay very well and have excellent quality eggs. I don’t feed 100% sprouted grains as I don’t feel that they get sufficient vitamin and minerals in just sprouts. I feed out the sprouts at day 4. They have free choice commercial layer ration and are fed their sprouts morning and night. A sack of barley or wheat is significantly less expensive than is a sack of layer ration so when I can cut my commercial feed bill in half that is a savings I can live with as replacing that commercial feed with barley or wheat saves me a lot of money. Yes, it is time consuming so if you don’t have time to deal with growing fodder it is not a good fit. If you only have a few chickens, the time required to grow sprouts is minimum. We also grow weiner pigs each year on 7 day fodder and goats milk – no commercial feed. Our butcher says our hog meat is the best he has ever seen! Additionally, when we first began this little homestead project, we fed everything with dry grains and commercial feed. As far as digestibility, on dry grain, cleaning out the manure pens you find a whole lot of undigested grains when feeding dry. Feeding fodder, there are no undigested grains. The animals are getting the full benefit of the grain as opposed to eliminating it all. I am no scientist but I do know from experience that my animals are happy and healthy and do very well on fodder and sprouts. And my pocket book is happy as well! Thank you so much for taking the time to reply! I really appreciate your information…because quite honestly I haven’t given up on fodder. I’m still in love with it 🙂 If you don’t mind me asking, how much time a day do you spend working with the fodder with all the cleaning, changing out, washing it several times a day and feeding? Time growing fodder is different depending upon the time of the year. We only have pigs spring to fall so that is the most intensive time for sprouting. When we raise 3 to 4 pigs fodder chores take about an hour and a half a day. That includes both the pigs and the chickens fodder/sprouts. In the winter months we only have chickens and it takes me about 15 minutes in the am and 5 in the pm to do chores. That said, we have somewhere between 70 and 100 chickens so fewer chickens would not take a significant amount of time. I rarely have to clean my barley. Occasionally I will have to but not often. The chaff and whatever needs to be cleaned off mostly floats to the top of the bucket when you begin the soak and can be scooped off if there is to much. I water in the am and pm. only. I dont water any other time. It is simply am and pm chores. Feeding out I don’t count as time as I do chores am and pm anyway and dumping the sprouts into a feeder doesn’t take any time. Fodder takes alot more time to deal with than does sprouts. The extra time it takes me to do the fodder for the pigs is worth it for the great pork we get. We have tried giving our dairy goats sprouts as well as fodder and while they do love it, I did not see any milk gain with it. I have no doubt it is healthy for them but the time it took to grow the additional feed for them was not worth the end product. I am very happy with fodder and sprouts for pigs and chickens as it truly has saved me significant dollars, particularly for the hens. Thank you so much for sharing your experience! That’s exactly what I want to know. One question: how many days are you growing your fodder? Can you explain more about if you feed sprouts or fodder and how many days you grow? Thanks! And thanks for the input! The way forward is to conduct a reality check and feedback from those actually using fodder systems. Feedback had been positive and encouraging like Dareen positive comments here on reduction of feed expense & overall health of animals. I hope future facts & researches will emerge to support the use of fodder. I completely agree! And in my YouTube video I encouraged people to show me and everyone what they are doing and how they are doing it, how long it takes them each day and the outcome! I want to hear from people who have been doing fodder on a LONG-TERM basis, feeding a good amount of animals (goats, pigs, bum calf and chickens, not just 25 chickens) and seeing success and healthier animals. I haven’t given up on fodder! I just know it can’t add a lot of time and frustration to my day. Thanks for the input!